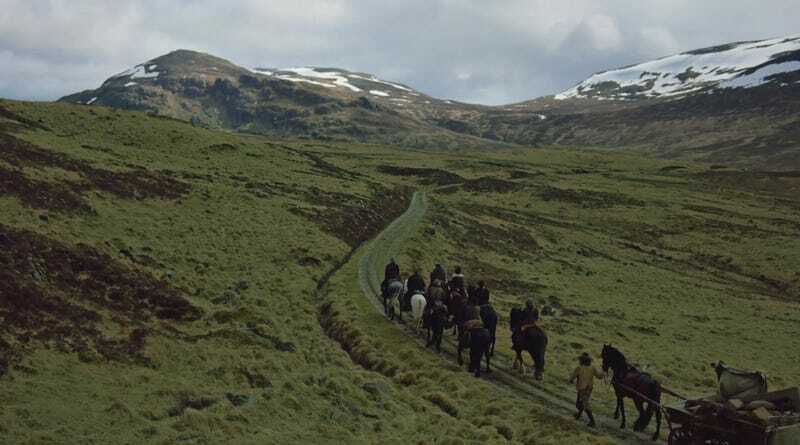 This week on Outlander, Claire finds out what it truly means to be English in the Highlands, and why Dougal is so keen on finding out whether or not she is an English spy. The trip to gather MacKenzie rents is more than meets the eye, and Claire's ability to stay out of "clan business" is tested. This week, we are on the road with the MacKenzie men, out to collect rent from Colum's tenants. Owing to his infirmity, Colum sends Dougal out to travel the MacKenzie lands, with the MacKenzies' lawyer, Ned Gowan. Dougal faithfully collects, and Ned records, all of the rent payments, be they coin, crop, or beast. However, when the sun goes down and the MacKenzie business is done, we see Dougal has a secondary motive (and a second coin purse, and a second set of records). Claire doesn't understand Gaelic, so she doesn't know what Dougal is saying, but she knows he's taking a second set of money. She concludes that Dougal is lining his own pockets without Colum knowing; taking from those who have little to fatten his own purse. Claire despises this, and is not afraid to show it. No, even when warned by Jamie to stay out of it, and being threatened by the men, she still can't hold her tongue in front of what she considers petty theft. Especially since Dougal decides to use any advantage he has - like showing Jamie's back to strangers, when Claire knows he hardly ever shows it to friends. Claire thinks she has Dougal's scheme figured out, and hates him for it; and Ned Gowan is more than happy to let her think whatever she likes, as long as it's not the truth. As they travel, Claire is exposed to the constant dangers of Highland life. There's the Watch, who are happy enough to protect you or your property - for a fee - unless you help the Redcoats, in which case they burn your house and steal your stuff as a warning against traitors to the Scots. There are the Redcoats themselves, who kill people, mark their flesh, and hang them up as a warning against traitors to the English. They also raid farmers and take whatever they want, leaving them starving and unable to pay rent to their laird. The group sees the fallout from the English troops' actions firsthand, and Dougal gets so riled that Claire is finally able to figure out what the side money is for. Not for Dougal's own pockets, but in support of the Stuart king. Dougal is a Jacobite. Through flashback, we see Claire learn of the 1745 Jacobite rebellion from Frank. And Claire first feels the true burden of a time traveler. She knows the outcome of the rebellion will be disastrous for the men standing before her, riding with her, fighting for her honor, laughing at her jokes. How can she tell them what's to come? Is it possible to dissuade them? How can she convince them their cause is doomed? Should she even try? Meanwhile, Jamie seems an unwilling participant in Dougal's Jacobite schemes. He requires his uncles' protection, so he bears the disrobing during Dougal's speeches as well as he can, but it clearly troubles him. He also keeps an eye out for Claire during their travels, which is difficult given her outbursts against Dougal's actions. But he does what he can to keep the men from hurting her, and even sleeps outside her door to protect her from unwanted advances by drunken Scots. By the end of the episode, Claire is on pretty good terms with Dougal's men, though Dougal himself still sees her as a threat. He doesn't want her around to warn his men that the Jacobite cause is lost, when he is trying to rally support and money for the Stuarts. Enter a group of Redcoats, headed by a nice gentleman who saw Claire in apparent distress among the Highlanders, but who was unable to aid his countrywoman due to being outnumbered by the MacKenzies. He's not outnumbered now, and he asks Claire if she is with Dougal against her will. Aaaand, credits! Oooh, a cliffhanger! What will Claire say? (From the previews for next week, it appears that she says yes, and goes with the Redcoats.) This is an interesting change from the books, and I'm very curious about how things go for Claire as she apparently encounters Black Jack Randall again. My guess is that it doesn't get her any closer to Craigh na Dun like she's probably hoping. Jamie: "Sleep in your room? With you? I couldn't do that. Your reputation would be ruined." Claire: "My reputation? You've slept under the stars with me before. You and 10 other men." Jamie: "Well, that isn't the same thing at all." Claire helps some village ladies waulk wool. They sing a waulking song, of which there are many! The ladies use urine to set the dye and tighten the weave. They beat the fabric rhythmically while singing, moving the cloth to the left. (It's bad luck to go counterclockwise.) Some great references are here and here; also find some information and samples of waulking songs online.